We in India have heard, read about Swami Vivekananda and his genius since childhood. Have you ever wondered about - how was he as a person, what hardships he had to face in his life, the food he loved, did he face any health issues? If this part of Swamiji's life interests you then you need to read Shankar's book - The Monk As Man. Apart from these facts, I also found reasons why Swami Vivekananda was accepted wholeheartedly by the people in US and Europe. Many of them became his admirers and some disciples. 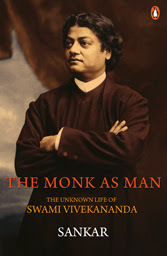 About the book : The Monk As Man - the unknown life of Swami Vivekananda explores the facts of Swamiji's life which are hitherto unknown to many readers. The book is divided into 5 chapters - A Monk and His Mother, Emperor, Monk and Cook in One, The Monk Who Loved Tea, Swamiji's Health and Thirty-nine Years, Five Months and Twenty-four Days. Mani Shankar Mukherjee better known as Shankar is a popular name in Bengal literature. Original book written in Bengali by him has sold over one lakh copies. Family Feuds/Legal Battles : Narendranath Dutta(12 January 1863 - 4 July 1902) was born in a wealthy Bengali family. But as fate would have it, family lost everything in legal suits. 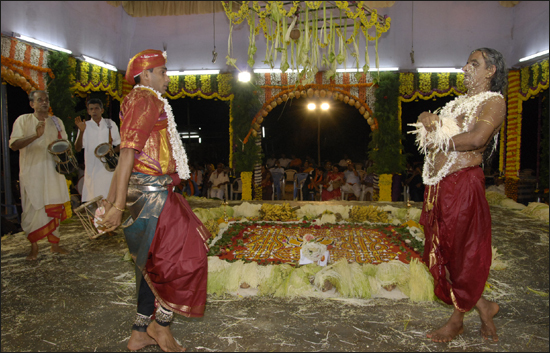 Litigations involving his mother Bhubaneshwari Dasi and coparceners went on for several years(1880 to 1902) till Swamiji's last days. This was constant source of worry for Swami Vivekananda. This is a major aspect of his life covered in this book. Also, though Swamiji had renounced his familial ties he continued to support his family thus shouldering his responsibilities. Source of Inspiration : It would be surprising to know that Swami Vivekananda, who is well known for his eloquent speeches and powerful writing in English, scored only 47 out of 100 in English in entrance examination, 46 in First Arts Standard and 56 in Bachelor of Arts. This should serve as a great source of inspiration for those who get disheartened by their poor marks in examinations. At least they should realize that they have to face bigger examination called life. Bengali Cuisine : If you are alien to Bengali cuisine, this book presents glimpses of the same. Reader is introduced to variety of Bengali dishes. Only downside here is that if you are unfamiliar of these dishes, then it is difficult to taste its flavour in this writing. One of Swami Vivekananda's favourite snack in Kachuri. But I could not make anything of this food inspite of its description given in English. You would be delighted to know that Swamiji was an excellent cook too. He used to cook for his disciples in India and abroad. Also, he used to experiment with Indian and western cuisines. This apart, his take on the type of food Indians should have to keep themselves fit and healthy keeps readers glued. After reading the chapter on food and Vivekananda, I felt elated about my love and perfectionist outlook towards food! Swami Vivekananda and Tea : From the book, we also come to know that Swami Vivekananda was a prominent advocate of tea! Did you know that there are 5 common words for tea in Sanskrit - shleshwari, girivit, shyamaparni, atandri and kamalarasa. When municipality authorities increased taxes on the math stating that it was Narendranath Dutta's private garden house with tea being frequently served, Swamiji sued Bally municipality and won the case! Swami Vivekananda's insight into the use of tea in different nations forms an interesting read. He was of the opinion that tea should be had without adding milk. Health Issues : Many people conclude that Swami Vivekananda was healthy and fit looking at the Chicago style posters (based on photograph by Thomas Harrison). But do you know that he suffered from insomnia or trouble in getting sleep? He also suffered from indigestion, gastroenteritis and other stomach ailments. He had lost vision in his right eye due to diabetes. He consulted doctors following various forms of medicine both in India and abroad. In spite of these health complications, Swamiji relentlessly worked towards promoting Vedanta and building the Ramakrishna Mission. But there are references where he emphasizes that he had overworked. Universal Love : One prominent thing I noticed in this book about Vivekananda was his acceptance and love towards everybody. When he went to US and England, he treated everyone as his own. He learnt their customs, followed them, respected their culture and never got chauvinistic about his Indian origin and culture. Also, he was very objective in his approach. If he has to condemn something, he would do so irrespective its origin. I think this impartial approach, objective sense and universal acceptance is what made Swami Vivekananda so popular in the west and why he is revered even today. Touching Last Lines : Last chapter had a great impact on me. It describes the day of Swami Vivekananda's death. In someway, it summarizes the whole life of Swamiji. I will not say much about this as I think it is best read on your own. But 2 things I would like to mention here. 1. Once Sister Nivedita was asked to explain the difference between Sri Ramakrishna Paramahamsa and Swami Vivekananda, to which she answered that Sri Ramakrishna Paramahamsa is the symbol of all that India has thought about for the past 5,000 years and Swami Vivekananda is the symbol of all that India will think for the next 1,500 years. How true, isn't it? Needless to say my respect towards Swami Vivekananda grew even more after reading this and especially after that last few lines! Repetitiveness: One thing about the book which annoyed me is its repetitiveness. I mean few incidents getting mentioned again and again. Though this is inevitable in some cases for getting readers reminded of the background, other times you feel it is avoidable. I read this review yesterday; it was interesting to know about the book on Swamiji’s life as a normal man. Thanks for publishing the link in facebook, I will certainly pick this book…. Thanks Atheeth. I believe this is must read book. Excellent review my friend! When the review is so good, one ought to buy this book and know about the great saint. Thanks Anonymous :) for those appreciative comments! Nice review Raveesh . Liked the succinct way in which you reviewed . Hope to read the book soon.